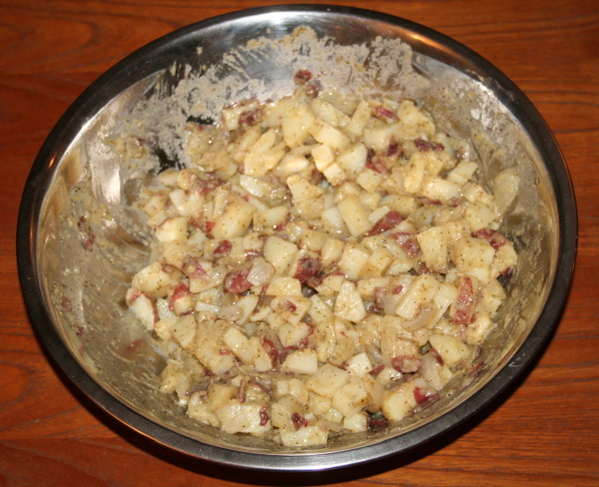 When many Americans (especially Midwesterners) hear “German Potato Salad”, they frequently think of a warm, vinegary potato salad, sometimes including bacon. In fact, this sort of potato salad can even be found in cans in the supermarket. In my numerous trips to Germany, I can’t recall ever eating potato salad of this sort. Most of the potato salad I ate there was more similar to American potato salad, containing mayonnaise, and sometimes boiled eggs. I definitely had quite a few other variants though, and my favorite one was from my friend, Markus Hofbauer. 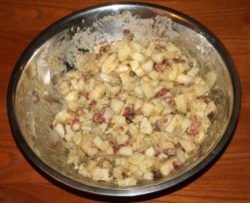 This one is a bit more similar to the Midwestern vision of potato salad, as it contains vinegar, but is usually served cold or at room temperature. I don’t think that Markus put any dill in his version, but I think it makes a nice addition. And, because it’s vegan, you don’t have to worry about anyone getting food poisoning from eating your potato salad that has been sitting out during a hot summer picnic. Boil the potatoes in salted water until just tender (about 20 minutes). Drain the potatoes, reserving the liquid. Add the chopped onions while the potatoes are still very hot; this will make their flavor a bit milder. Then add the oil, vinegar, and spices, stirring frequently. Now gradually add some (not all) of the reserved liquid until the desired consistency is obtained. The starches from the potatoes that are left in the reserved liquid will help make a creamy sauce, without the use of any traditional creamy additives such as mayonnaise. Let cool for at least 1 hour before serving.